In addition to the core curriculum, students enroll in classes, lessons, and ensembles particular to their individual program. Course registration occurs for incoming students during June orientation sessions with Assistant Dean Eva Gorbants, then with faculty advisors in subsequent semesters. Students first consult the appropriate sample curricular outline to determine complete and incomplete requirements, then meet with their advisor(s) to discuss course selections. (Some courses require permission numbers obtained from the professors teaching those courses.) The advisor then releases the hold in the online registration system which then permits a student to enter the system and complete enrollment. It is essential that students report any change in curricular plans to both their advisor and to the Program Assistant in the Music Office. During the first ten days of a semester, a student may add and/or drop courses without penalty. Later changes may be possible with requisite signatures on an add-drop form, found here. Students should receive or be able to access studio policies or syllabi for all classes, lessons, and ensembles. These documents detail instructional goals, student expectations, attendance policies, important calendar dates, and other information pertinent to the setting. Professors also establish office hours, during which they are available to meet individually with students. Classes, lessons, and rehearsals cancelled because of university closure need not be rescheduled. Professors are expected to make up or make substitute arrangements for classes missed for personal or professional reasons. At or near the end of each semester, students are asked to provide feedback about their experience in classes, lessons, and ensembles. Course Evaluations provide instructors, departments, and the University with information that is critical to developing and modifying curricular offerings and instructional methods. Music majors attend a weekly, zero-credit performance workshop designed to provide exposure to music outside the major area and a venue for a yearly performance. Requests to perform at Convocation must be completed on an agreement form that requires the signatures of the applied teacher or coach and any accompanist, available here. The Department of Music records and archives all Convocation performances. A single copy of the recording of each Convocation is placed in the Music and Dramatic Arts Library “on reserve,” and students may listen to their performances there. These recordings do not circulate outside the library. They are removed from the library reserve at the end of each academic term. All music majors receive fourteen one-hour lessons per semester. The amount of credit varies according to major and level, and expectations for the amount and type of practice, the repertoire to be studied, the technique to be mastered, etc., are detailed by the instructor in the relevant studio policy. Unless an exception is made by the department head, participation in an appropriate ensemble, MUSI 1110, 1111, or 1112, is required each semester for students registered in MUSI 1222 (3222). The same requirement is in place for secondary applied lessons (MUSI 1221). One-credit lessons (30 minutes) on secondary instruments (MUSI 1221) are available with the consent of the instructor and the department head. Depending on their applied area, students have varying needs for the services of one or more accompanists and must pay individually for those services, unless the accompanist is fulfilling requirements for an accompanying class or a scholarship. Students must arrive at accompanying rehearsals thoroughly prepared; lack of preparation entitles an accompanist to cancel the scheduled rehearsal. Dr. Angelina Gadeliya, Keyboard Coordinator, can help students identify and contact appropriate accompanists for lessons, juries, and other performances. Accompanists set their own fees. At the end of each semester, all students enrolled in applied study perform a 10-minute jury for a faculty panel of no fewer than two. Students receive from each member of the faculty panel a letter grade for the jury that is averaged with the other(s) to constitute a certain percentage of the applied-lesson grade for the semester, as specified in the grading policy on the teacher’s studio syllabus. Typically at the end of the fourth semester, Bachelor of Music and Pre-Teaching majors perform a 20-minute promotional jury for a faculty panel of no fewer than two that must be passed for admission into upper-level study. As with other juries, students receive a letter grade from each member of the faculty panel that is averaged with the other(s) to constitute a certain percentage of the applied-lesson grade for the semester, as specified in the grading policy on the teacher’s studio syllabus. A student must receive a B average from the panel to be considered to have passed the promotional jury. A student that does not pass the promotional jury is permitted one re-take, preferably during the next semester’s add/drop period (the first 10 days). However, if the faculty deems another semester’s study at the lower level to be in the student’s best interest, the re-take can occur at the end of the fifth semester. (As three semesters of upper-level study are required for a music education major, this would necessitate taking lessons during the student-teaching semester [i.e., semester 8]). In the case of a student not passing the promotional jury, the applied teacher will communicate to the department head the panel’s recommendation for an appropriate course of action. Recitals required for graduation, i.e., junior half-recital and senior recital, are preceded no later than 14 days prior to the recital date by a pre-recital jury before a panel of faculty of no fewer than two. Students receive a letter grade for the jury from each member of the faculty panel, which are averaged. A student must receive a B average from the panel to be considered to have passed the pre-recital jury and permitted to present the scheduled recital. A student who does not pass the jury is permitted one additional jury. Recitals are graded by a panel of no fewer than two faculty members. Students receive a letter grade for the recital from each member of the faculty panel, which are averaged. A student must receive a B average from the panel to be considered to have passed the recital. The applied teacher reports in writing the result of this average to the teacher-of-record for Senior Recital, i.e., the Director of Undergraduate Studies. 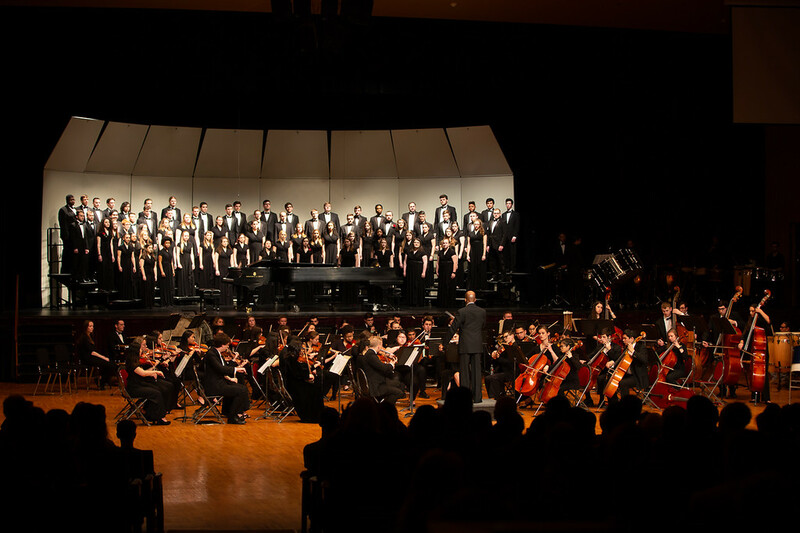 Concert Choir, Symphonic Band, Wind Ensemble, and Symphony Orchestra compose the department’s major ensembles. Auditions for these ensembles occur during each semester’s first week of classes and are open to the entire campus. Repertoire requirements and sign-up sheets are posted on relevant bulletin boards within the music building and online. Assignment of students to particular ensembles is the province of the conducting faculty. Expectations for each ensemble are detailed in the appropriate syllabus. Students in their last two years of the BA Jazz Emphasis Program may enroll in Jazz Ensemble as their major ensemble. Vocal performance majors in their final year may substitute Opera Workshop for Concert Choir. A limited number of small ensembles (generally conducted) are offered and, depending on the major, may be required. Additional performing opportunities are available in other departmental ensembles, in student organizations advised by departmental faculty, and in other campus organizations. Students can only earn credit for participating in departmental ensembles and must be prepared to meet the attendance, preparation, and performance requirements of any ensemble. Chamber music is for two or more players, each playing a separate part, and is not conducted. 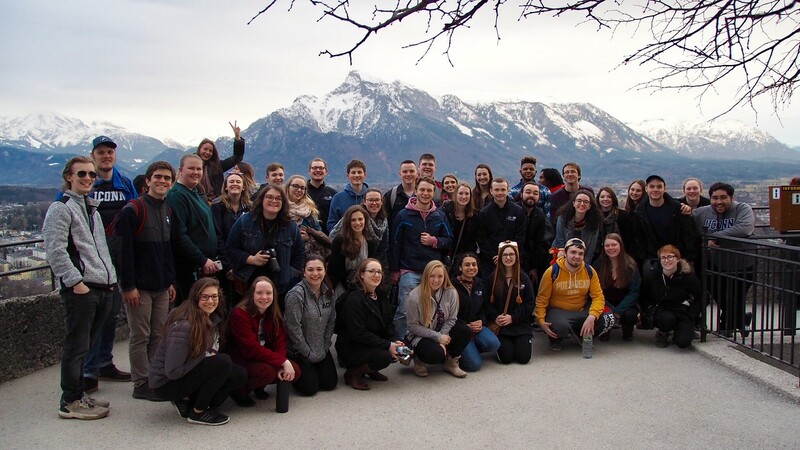 Chamber groups can be formed by students, with the approval of their applied teachers and the Chamber Music Coordinator, Harvey Felder, or by Professor Felder in conjunction with the relevant applied teachers. Each group is assigned a faculty or graduate-student coach who meets with them for an hour each week. Groups are expected to rehearse several times on their own between coachings. The Department of Music records and places all chamber music and large- ensemble performances into an archive. A rough mix version of these is placed in the School of Fine Arts Resource Center for student use (usually the morning after the performance). These rough recordings are for reference and teaching purposes only, and they do not remain permanently in the library. In addition to the rough mixes, archived recordings of major ensembles are mixed and mastered professionally, catalogued, and kept as a regular part of the library collection for instructional purposes. It generally takes several weeks for these finished archive recordings to be mastered by the audio staff and cataloged by the library staff. Some compositions performed by major ensembles are selected by the conductor of those ensembles to be placed on The Department’s website as streaming files for a limited time. In keeping with present interpretations of copyright, we pull the rough mix recordings when the finished archive recording is placed in the collection, thus maintaining only a single copy in the library. In addition to requests for recital recording, students can request audio/video recording sessions to prepare audition/application material or for other purposes. Most occur in von der Mehden Recital Hall, and all are approved on a case-by-case basis depending on the time available. Department Head Dr. Rice receives and approves the requests. It is the responsibility of the student requesting the recording to first reserve the venue, and as soon as a date has been obtained, complete the Audio Services Request form, found here, and pay the fee. Recording sessions are charged on a per-hour basis with payment for one hour of engineering time and one reference cd made at the time of the request. If the session takes more than one hour, additional fees must be paid before the recording is released to the student. 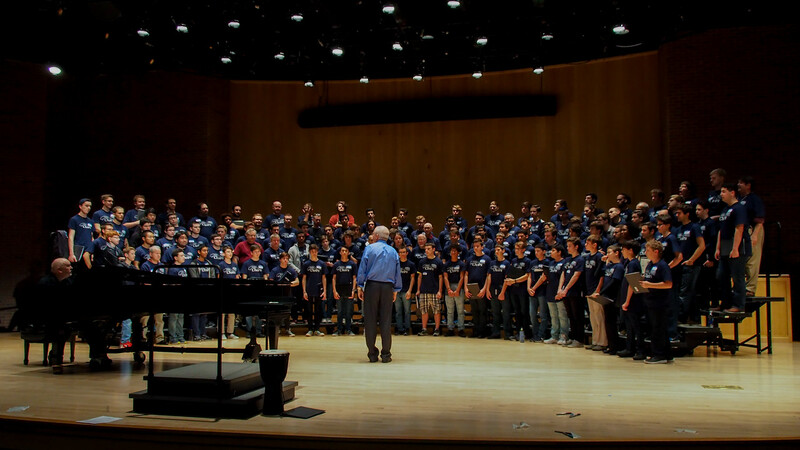 All performances presented by The University of Connecticut as part of its academic concert calendar and/or its instructional programs may be audio recorded, filmed, photographed, or videotaped. 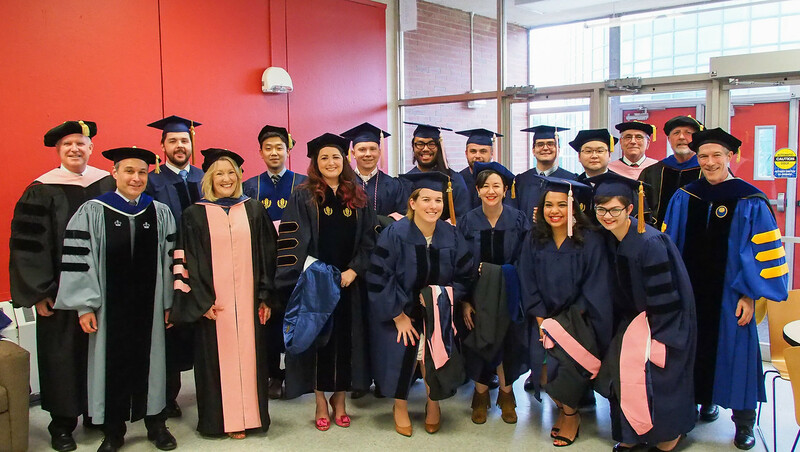 These sound and/or image recordings include performances by University of Connecticut ensembles, performing groups and organizations, as well as performances by individuals given on or off campus as part of the academic program of the University of Connecticut. Also, the University of Connecticut may photograph students or video record their images as during university-related daily activities. The University of Connecticut reserves all rights to these audio recordings, films, videotapes, and images (known collectively hereafter as “Recordings”), including the right to publish, reproduce, broadcast, license, assign, and distribute the Recordings and derivatives thereof in all media, including electronic media and publication on the World Wide Web, for any purpose and without limitation including commercial release, in perpetuity. All students who are members of musical performance ensembles and/or enrolled in music classes assign to the University of Connecticut all copyright and other rights in such performances and Recordings, including any proceeds earned from commercial distribution or other use of the Recordings. In addition, a student’s name and likeness may be used by the University of Connecticut and its agents in the published materials associated with these Recordings. The University of Connecticut is released from any claims arising out of broadcast, commercial distribution, and promotion of these recordings.